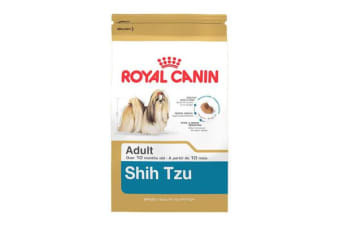 Ideal for adult Shih Tzu’s over 10 months of age. Exclusively designed kibble to make it easier for the Shih Tzu’s brachycephalic jaw type and short muzzle to pick up. The kibble’s shape and texture encourages the Shih Tzu to chew more which helps limit dental plaque deposits. Helps support the skin’s role as a barrier with an exclusive complex of nutrients and helps maintain overall skin health (EPA, DHA and Vitamin A). Contributes to maintaining the health of the Shih Tzu’s long coat with its continuous growth and natural softness. Enriched with Omega-3 fatty acids (EPA ; DHA), Omega-6 fatty acids and biotin for sustained coat health. Reduces faecal smell and volume, and helps support good digestion with highly digestible proteins (LIP), an appropriate fibre content and high quality carbohydrate sources. Contains a blend of important vitamins, minerals and antioxidants necessary for a healthy body. <!— —> Check out this video for more information: Originally founded in France in 1967, today Royal Canin is one of the leading pet nutrition brands worldwide, and for good reason. Royal Canin were the first to develop many of the specialised diets for different dogs and cats that exist today. Royal Canin make the most precise and effective nutrition for cats and dogs based on breed, size, age, lifestyle, weight, gender, digestion, genetic makeup and other specific needs. To do this, they have accumulated vast knowledge about cats and dogs that only extensive observation and tireless dialogue with pet professionals, breeders, veterinarians and owners can provide. In order to create health nutrition that makes a difference for cats and dogs, Royal Canin maintains constant respect for their fundamental animal nature and unique nutritional needs. Want to see what the dog bowls of tomorrow look like? Check out our latest range of Petkit smart bowls here! Why not put your dog’s food in a feeding toy so your dog can be entertained for hours trying to get it out? Check out our range of dog feeding toys here! Ingredients Rice. Dehydrated poultry protein. Animal fats. Vegetable protein isolate*. Hydrolysed animal proteins. Vegetable fibres. Beet pulp. Minerals. Fish oil. Soya oil. Fructo-oligo-saccharides. Borage oil (0.1%). Marigold extract (source of lutein). Green tea and grape extracts (source of polyphenols). Hydrolysed crustaceans (source of glucosamine). Hydrolysed cartilage (source of chondroitin). ADDITIVES (per kg): Nutritional additives: Vitamin A: 29500 IU. Vitamin D3: 800 IU. E1 (Iron): 53 mg. E2 (Iodine): 5.3 mg. E4 (Copper): 10 mg. E5 (Manganese): 69 mg. E6 (Zinc): 206 mg. E8 (Selenium): 0.12 mg. Technological additives: Pentasodium triphosphate: 3.5 g. Preservatives – Antioxidants. ANALYTICAL CONSTITUENTS: Protein: 24%. Fat content: 20%. Crude ash: 5.6%. Crude fibres: 3%. *L.I.P. : protein selected for its very high assimilation.